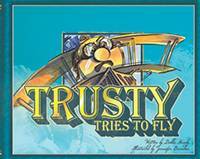 Trusty Tries To Fly is part of the Children's Collection. Trusty watches as Pixie swirls and twirls around in the air. He is sure that if he tries hard enough, he can fly too! And when he sees Bubbles whizzing by with a big gust of wind, Trusty is convinced that he can sail, too! But he can't. He's just not made the same way. He feels stuck. But then, on a cold winter night, Trusty understands why God made him just the way he is. You Will Love the Trusty Books! From Joni Gott of Hemet, California on 12/6/2017 . I bought this book as a Christmas present for one of my grandsons. I have given them other books in this series and they love them all! They are one of the books that they ask me to read to them every time I visit. Every book has a life applications that is illustrated in a fun way. Please keep writing more!